In our age of bloggers, spammers, texters, and tweeters, there are types of writing earlier eras couldn’t have imagined. But there are also many old, out-of-use words for very specific types of writers (and also terrible writers). At the risk of being a puffer, here are some obscure things to call a quill-driver. 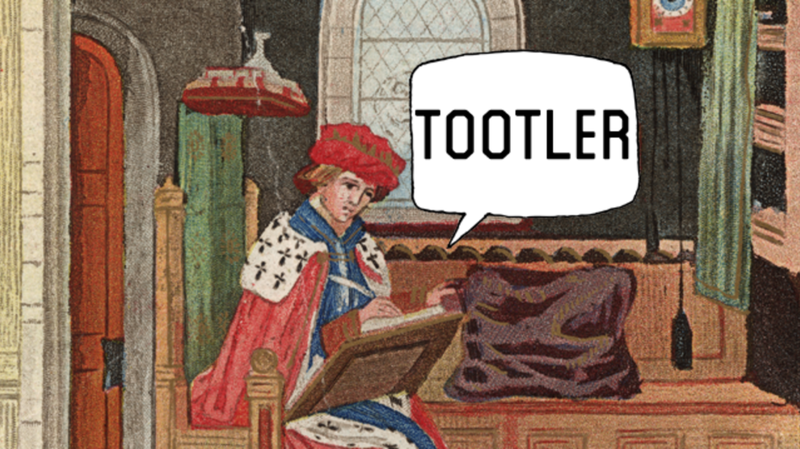 The Oxford English Dictionary defines a tootler as a “a writer of ‘tootle’, verbiage, or twaddle.” Tootling took a trip down Horsefeathers Avenue because early meanings referred to birdsong or the notes of a wind instrument, both of which can be pretty but rarely present a logical argument. This noun, in print since the 1600s, would not be useful at all today, since it refers to a sarcastic writer. Sarcasm is harder to find on the Internet than kittens. A catastrophist has often referred to a specific type of pessimist—someone who thinks life is constantly falling into debacle and disaster, with apocalypse right around the corner. But the word gained an even more specific meaning thanks to the 1930s Polish Żagary movement: writers who were part of this movement were called catastrophists. A blotter—like the similar term paper-stainer—is a writer who is not doing much more than literally leaving a mark. Along the lines of blotting, there’s the ignoble profession of smear journalism. Sometimes such writers have been known as smear merchants or smear-mongers. They use smear tactics in smear sheets, where they do smear jobs. This term—which could name a literary superhero and member of the Avengers—has had two meanings. A bookwoman (or a bookman) is someone who loves to read, but a bookwoman can also be a female writer. Many similar sexist terms used to be common, such as authoress (a broader term than murdermongress, a word Ogden Nash used to describe Agatha Christie) and sob sister (an advice columnist for the lovelorn, which was Lois Lane’s first job in the original Superman comics). Another milestone in sexism was the rare word writrix, which can be found in an astounding 1772 sentence written by José Francisco de Isla and recorded by the OED: “Why should it not be said, she was not a common woman, but a geniusess, and an elegant writrix?” Yikes. This is one of many terms that simply alter the name of the type of writing. A coupleteer writes couplets, much as an epigrammatarian writes epigrams, a legendarian writes legends, and a manuscriptor writes manuscripts. This sounds like the name of an action or horror movie, but it’s just a type of scribbler: specifically, an obituary writer. Death-hunter has also referred to fun professions such as undertaker and corpse-robber. This very rare term—only found in 1671 (and possibly a misspelling of squibber)—is a scribbler who quibbles. Given the endless stream of pretentious think pieces, snotty comments, and mean tweets in the world today, this word could use a revival. So could anonymuncle—a word for an annoying anonymous writer. You can find even more words for ink-jerkers here.